I have gotten underway with “restoring” the 1947 Camille Daudon bicycle in my collection. Because the bike is so rare, I will only be using the gentlest techniques to bring the bike back to a rideable condition (though it will not be ridden regularly due to its rarity), as well as to make sure that any mechanical or maintenance issues are addressed so that the bike will continue to last through the ages. So, as I was carefully disassembling this bike, it came time to take off the crankset and remove the bottom bracket. Like other Stronglight cranksets of this era, the left side crank bolt is reverse threaded. 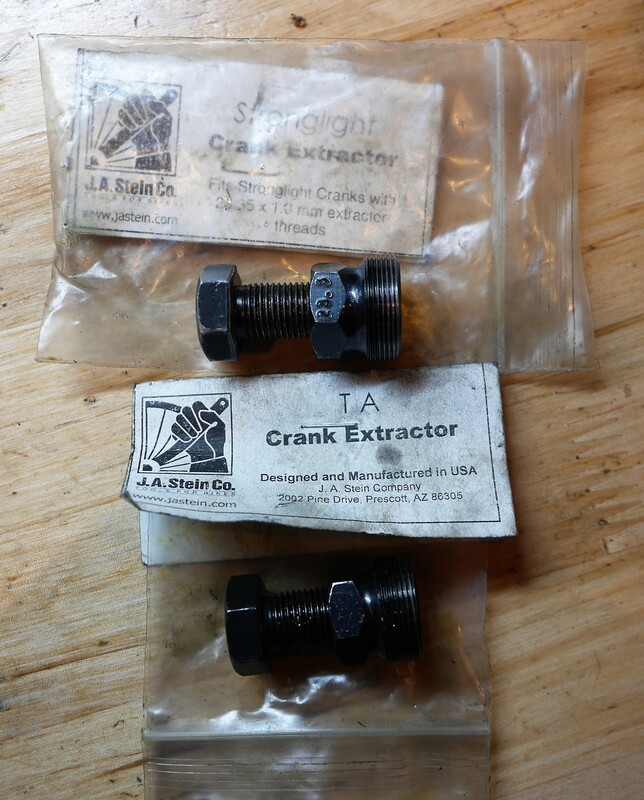 The dustcaps were missing, but I was hopeful that the crankarm threads were good. Hope springs eternal, as they say. When my J. A. Stein Stronglight crankpuller would not thread into either crankarm, I started to feel worried. I stopped all my work and took to the internet to do a little research. 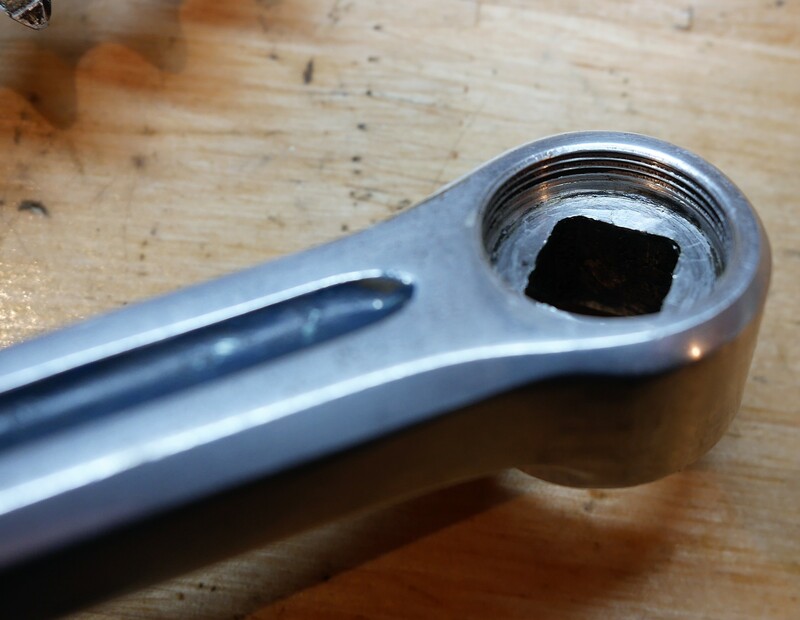 While the Park Tool site declares that any crank arm with damaged threads should be tossed out, I continued my search for guidance while rolling my eyes in disgust at such bad advice from Park Tool. Sheldon Brown recommends using an automotive gear puller in the event that you can’t use the crank arm threads. Before I pursued that route, I decided to try another idea, which was to thread a T A crankpuller into the crankarms, and possibly chase the threads to bring them back to life. Stronglight threads are only slightly larger than T A threads (23.35 vs. 23 mm). So, my first thought was to generously lubricate the crankarm threads and then try to thread in the T A crank extractor. 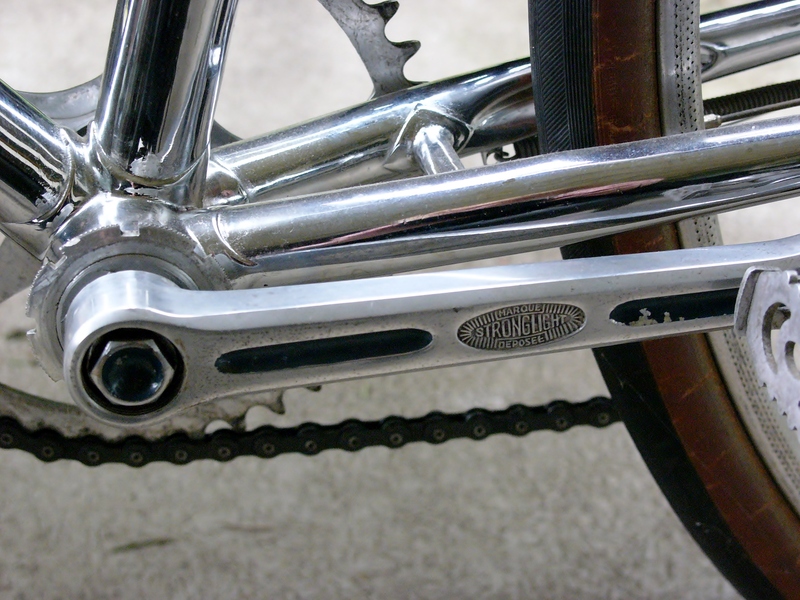 The T A extractor easily threaded into the crankarms on both sides. I then tried threading in the Stronglight extractor, hoping that the threads had been rejuvenated by the T A extractor. Unfortunately, the Stronglight crankpuller would still not thread into the crank arms. 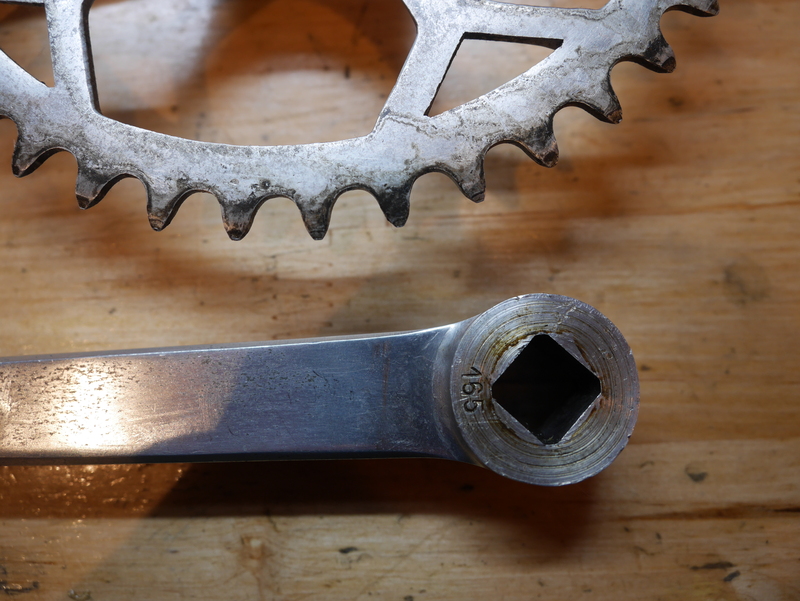 So, then I decided to use the T A extractor to remove the crank arms. Fortunately, I was successful. It didn’t want to use a lot of torque to bring the arms off of the spindle, for fear of further damaging the threads. As it turned out, the arms came off quite easily. When I looked at the threads, I didn’t see anything particularly amiss. So, with a little effort, I may be able to get these threads back to their normal state, by gently chasing them again. 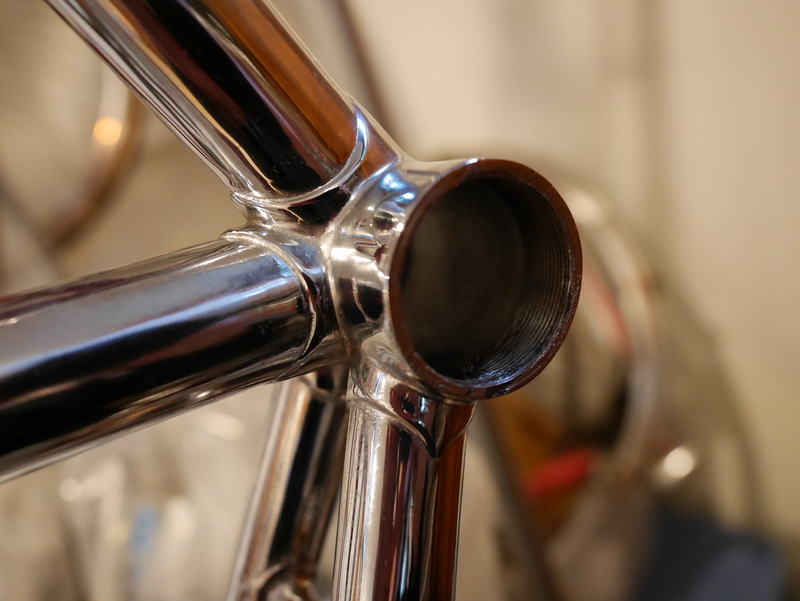 It was nice to see the Camille Daudon’s bottom bracket shell in such great condition. Another surprise was the 165 mm crank arms – a nice touch for a bike meant for a small rider. The 42T ring is a Cyclo Rosa – named after Cyclo’s founder’s wife. 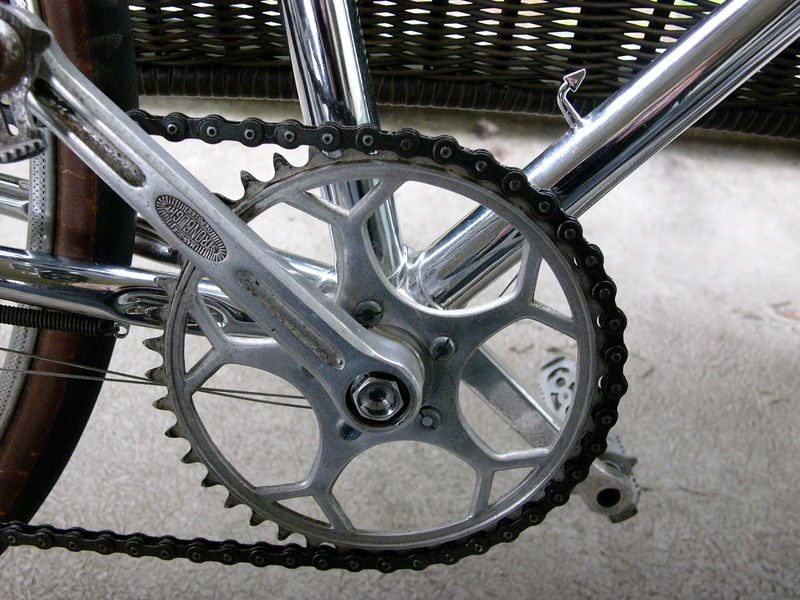 The bike is geared with a 4 speed freewheel, and with the 42 tooth ring, offers an appropriate range for city riding. The bike was custom built for Irene Faberge Gunst, who was a Paris native, but was a resident of San Francisco when this bike was ordered as a gift for her by her husband in 1947. Irene worked as a jeweler in the Faberge studio of her grandfather, and her own Faberge collection was displayed at various museums in the area in the 1960s. Her bicycle is a piece of art as well, and one that I hope to shepherd into the future. 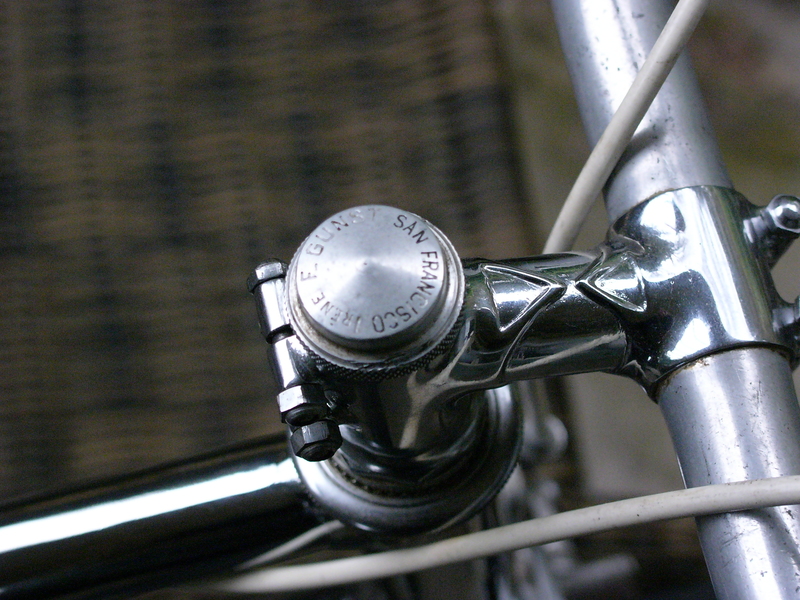 This entry was posted in 650B, Bicycle restoration, Vintage French Bicycle by Nola Wilken. Bookmark the permalink. 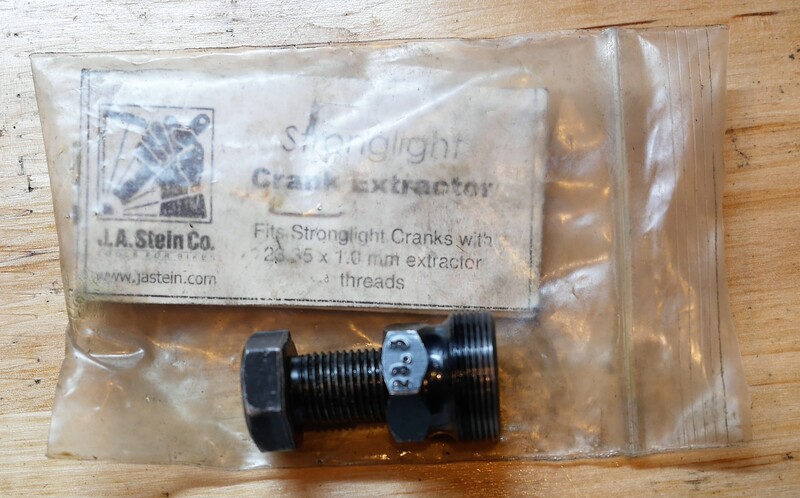 Having already seen extracting threads just being ripped by inexperienced mechanics being unaware of these crankpulling diameter subtleties, I wouldn’t have used a TA tool on an old Stronglight crankarm. Lucky you that it worked. My own experience tells me that the sheldon trick about the automotive extractor is a bit of a myth at least on the right side as it is extremely difficult to install and be effective on the right handside crank (mostly because of most of the spider designs). There is actually a specific Var tool to be able to spare the use of the thread if it is damaged but I have only seen it in a 70’s VAR Catalog and never in flesh – it bears the number 932 ! Its one of the tools missing in my tool collection but I am pessimistic about ever finding it. Hi Bruno, I wish I had that VAR tool as well. The search goes on. 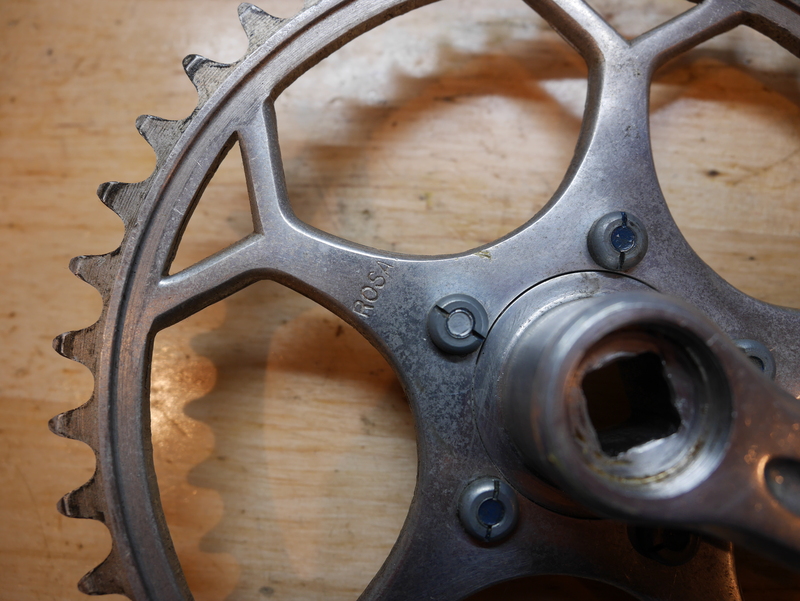 Using an automotive gear puller on this crankset might have worked because you could remove the chainring from the arm on the drive side. Since the chain ring and spider are essentially one unit, that might create the access points needed for the gear puller. I came across a helpful video from RJ The Bike Guy showing various attempts to remove a stuck crank: https://www.youtube.com/watch?v=FQRENlsXwTQ Fortunately, the crankarms on the Daudon had not been torqued on to spec, otherwise the TA remover might not have worked, and could have indeed stripped out the threads. Great work, Nola. That bike is amazing. 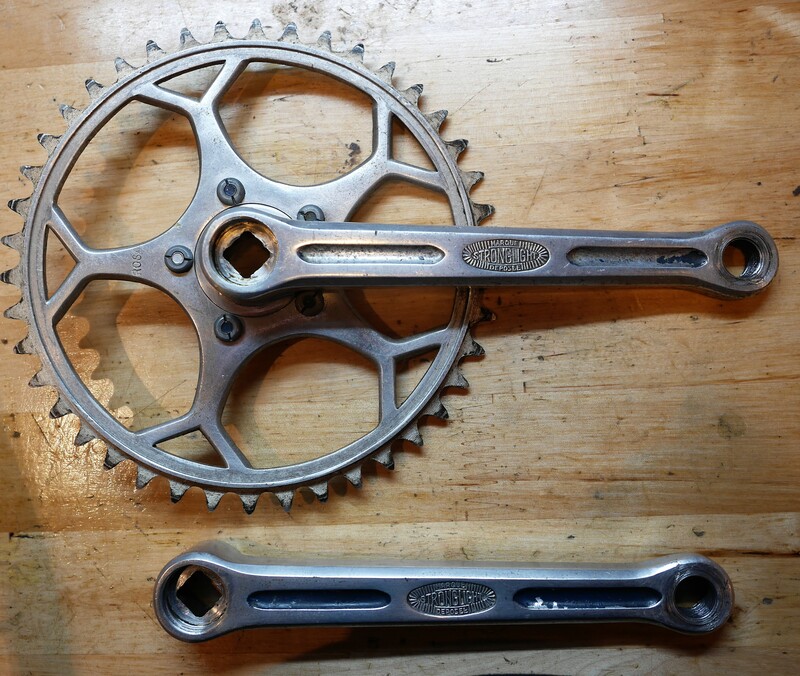 I had similar crank-pulling issues when I refurbished a friend’s Raleigh Competition, which has Zeus cranks. The crank bolts were 15mm, but my socket wouldn’t fit. Following advice from folks at Yellow Jersey in Wisconsin, I fired up the grinder and ground the socket’s walls thin enough to where they would fit. Presto. It also helps to know folks who have TA and Stronglight crank pullers. Great tip. It can be hard to find sockets with thin walls – so, make your own! 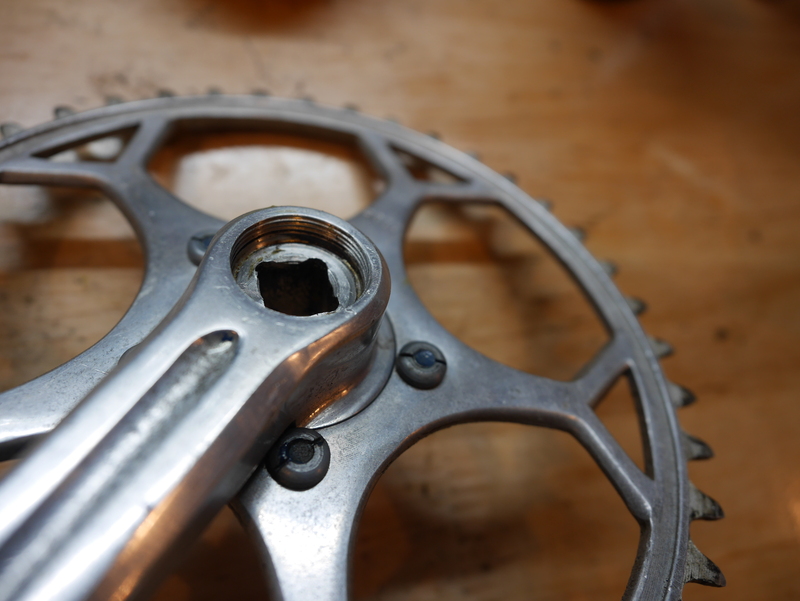 I have got a nice similar stronglight crankset with much more damaged threads than yours which look fine to me – strange the 23.35 extractor did not fit – and I wonder what to do ! shall I use the 24mm VAR “repair tap” PE11000 to rethread ( don’t even know if it will work and it is damn costly 😦 ) – but after that – the 24mm extractor is indispensable or else ?… Still mulling about it ! I’d say try something else before tapping out the threads. One thing I did with the smaller T A extractor was to grease it heavily before threading it in. I don’t know if that helped or not, because the arms were probably not torqued on to spec. Hola a todos aqui en mi pais Argentina, construimos una VAR 932 de manera artesanal. y funciono a la perfeccion. Hola, Ja-Ja. Did you machine the VAR 932 using an existing example?